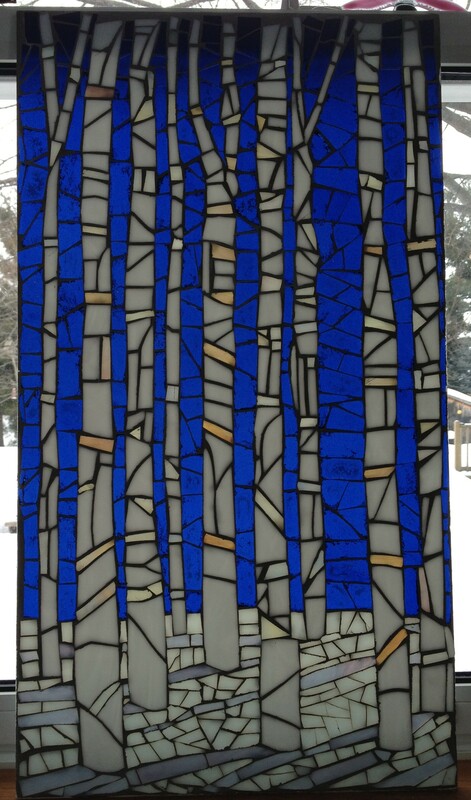 This Glass-on-Glass 13″ x 24″ mosaic of white birch trees in the winter reminds me of a drive in northern Ontario. I love this panel showing a cluster of trees in the winter. The white birch and white snow are set off by the darker blue sky perfectly. This glass-on-glass panel is 13″ x 24″ and uses a piece of frosted tempered glass for the base. It is grouted and sealed three times for outdoor use, but would look beautiful and provide almost complete privacy if used in the home in front of a window. It has likely close to a 1000 pieces of hand cut glass and the overall feeling is very tranquil.